Last Sunday, Raila was in St John’s Everlasting Gospel Church in Imara Daima attending the service where he was seen wearing a torn shoe. 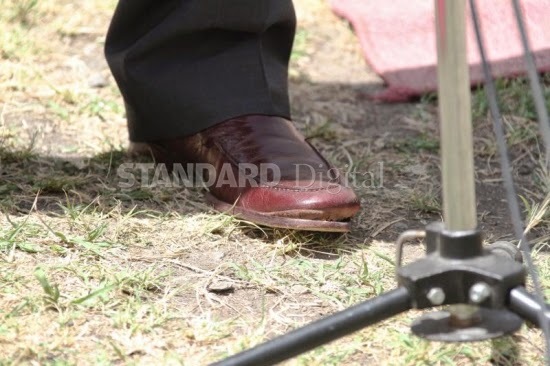 As kenyans went on social media to debate what might have been the problem , Raila's wife, Ida Odinga, has now come out to explain why her husband wore a torn shoe. Speaking to Nairobi News, Ida has said that Raila's shoe got torn when he knocked a stone at the church where he attended a function. “Can such a thing happen under my watch really? I am a fashionista for crying out loud. “I am the one who has been dressing my man and it is like some of you are not aware. Can I allow him to leave the house with torn shoes? Never,” she told Nairobi News in a phone interview. “I have been taking care of Raila all these years and nothing of such kind as ever happened. This is a very small thing that should not even worry me,” she said. She said that she has always been very keen on what her husband wears. “As smart as I have been always, there is no single day I have let my husband down. He cannot leave the house unless I approve that he is smart. He has to be smart, that is key,” she said.